What are we to make of the Genesis account of Cain and Abel? 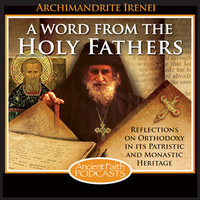 In this broadcast, Archimandrite Irenei examines a portion of St Cyprian of Carthage’s treatise on the Lord’s prayer that shows forth Abel as the first martyr, the example of true self-sacrifice. And it is a lesson with a practical aim: the quenching of anger and hatred, and the discovery of a life offered more wholly to God. Fr. John shares from Genesis 4. Fr. Thomas Hopko looks at Abel and Cain and why one offered acceptable worship and the other did not. In this episode of her continuing series on Genesis, Jeannie discusses the story of Cain and Abel. I would like to speak today on what is a firm word and yet an important word from our Father among the saints, Cyprian of Carthage, writing from the third century in Africa. In a passage dedicated to the Lord’s prayer, a tract dedicated to the Lord’s prayer, St. Cyprian speaks about the need to forgive, and how this is tied into the need to love, two things that we’ve recently traced out in these broadcasts. However, it’s an interesting passage in the 24th chapter in his treatise on the Lord’s prayer that I would like to examine today. St. Cyprian comes, as odd as this might sound, looking at the text externally, to focus on Cain and Abel, the famous story from the fourth [chapter] of Genesis, and he reflects on Cain and Abel as an example of the type of relationship in which love is not found, in which forgiveness is not offered. He uses Abel particularly as a model of how we are to receive the reproach of those who love us as well as those who hate us. St. Cyprian finds, in a beautiful manner, an example in Abel, whom as we shall see he calls the first exemplar of martyrdom, an example of the degree to which we are to bear insults even to the point of death, to bear wrong-doing even to this extremest of measures, in order to harbor in our hearts the true love of neighbor and the love of God that the Lord’s prayer, the Our Father, compels us to hold. Listen to how St. Cyprian introduces the story and the person of Abel. Abel (he writes), peaceable and just, while he was sacrificing to God innocently, taught others also, when they offer a gift at the altar, to come with the fear of God, with a simple heart, with the law of justice, and with the peace of concord. Worthily did he, since he was such in God’s sacrifice, himself become a sacrifice to God, so that, being the first to manifest martyrdom, he initiated the Lord’s passion by his own blood, who had both the justice and the peace of the Lord within himself. Such are crowned by the Lord; such on the day of judgment will be vindicated with the Lord. What a remarkable little passage this is, and what a beautiful insight St. Cyprian has drawn out from the life of Abel in the Scriptures. We recall from the fourth [chapter] of Genesis that Abel, like his brother, prepared to offer a sacrifice to God, and that God received Abel’s but did not receive his brother Cain’s. But look at what St. Cyprian has discovered: Abel was a man “peaceable and just.’ He sacrificed to God “innocently.” People often wonder at the strange confronting language of Scripture. In Genesis it simply says that God accepted and received Abel’s sacrifice, but he did not accept Cain’s, and this has been a passage that has caused concern and frustration and curiosity amongst many. Why would God receive the gift offered by one, but not another? And here St. Cyprian offers us a great insight. Abel offers in peace and in innocence, humility, simplicity. He offers wholly to God what is wholly his, with a gentle heart, whereas his brother offers in contrivance: he seeks gain. He wishes to justify the validity of his offering. “Why should God not accept this? It is a right offering,” etc. But these are not the ways that gifts are to be offered at the altar of the Lord. But more than this, the chief example Abel gives of the right way to offer at the altar of the Lord is not in the gift that he takes to sacrifice; it is in his own sacrifice. As St. Cyprian has so simply and eloquently said, “Worthily did Abel, since he was such in God’s sacrifice, himself later become a sacrifice.” Because Abel knew how to sacrifice in purity, how to offer in love, freely and without condition, how to present to God what was his, of his own, without expectation, without defense, so it was that Abel was able to offer himself as a sacrifice to God. Worthily did he become a sacrifice in his own person to the Lord, offering his blood, the first example of martyrdom. So we have in this initial part of the story, where we see the two sacrifices—the one made by Abel and the one by his brother—an example of how our own small offerings pave the way in the human heart for the full offering of our life. How do we offer our small gifts at the altar of God? In what way do we present to the Lord those things which he calls from us? Do we do it in gentleness, in simplicity, in innocence and purity, readily offering what the Lord demands? And more so, offering all that we have and all that we are? Or, like Cain, do we offer begrudgingly? Do we offer out of a sense of entitlement that shall come from our gift? Do we offer out of a sense of duty that must be met? Do we present our gifts to the Lord, expecting a response from him? And more than this, a certain, specific response that we desire? Is this the way we offer the small things? For if it is, if we side with Cain rather than Abel in the way we offer our gifts to the Lord, however great or small they may be, whatever their nature, we are paving the way in the deepest part of our heart for the type of self-offering we wish to make, and that self-offering is the most important, the most critical. Am I going through my begrudging, through my expectant, through my demanding sacrifices and offerings? Am I going to offer myself in that same limited, arrogant way? Or am I, through the little offerings I am called to make and do make, am I preparing my own heart, am I preparing my own will, for a simple obedience that will lead me to follow Christ wherever he may lead me, wherever he may guide me? Am I, like Abel, offering a sacrifice that will allow me to become a sacrifice when and if the Lord should ask it of me? This marvelous insight that St. Cyprian is able to draw out of the sacred Scriptures carries on in a second after the same section, and one which is perhaps not as obviously uplifting—it is, in fact, quite severe, quite harsh, and yet has much to teach us. Listen here to how St. Cyprian carries on with his discussion of Abel and his brother, Cain. The discordant and the dissident (he says), and he who has not peace with his brethren, according as the blessed Apostle and the holy Scriptures testify, not even if he be slain for God’s name shall he be able to escape the crime of fraternal dissension. For it is written: Whoever hates his brother is a murderer, and a murderer does not arrive at the kingdom of heaven, nor does he live with God. Whoever prefers to be an imitator of Judas rather than of Christ cannot be with Christ. What a sin it is which cannot be washed away by the baptism of blood! What a crime it is indeed which cannot be expiated, even by martyrdom! This also comes from the 24th chapter of St. Cyprian’s treatise on the Lord’s prayer. As I said, it is a harsh and firm saying. If we hate our brother, we become murderers. The Lord himself teaches us this, though look how often and how quickly we forget it. Most would recoil at the thought of committing a murder, and yet hate their brother quite openly and easily, day to day. And yet, to hate one’s brother, to commit what St. Cyprian calls “fraternal dissension,” it is not only the crime of murder, but it is a sacrifice of what is good and holy within us for something that is evil. It makes any offering that we can then show to the Lord a false offering. And the insight, terrifying as it may be, of St. Cyprian, is that this is true even if what we offer is our own life. If we come to the point of giving our life for God, but we do so hating in our heart our brother, we have not offered worthy sacrifice. We are then precisely like Cain, who offers what is his to God, but in a way designed to show up his brother. If we come even to the place of martyrdom, even to our own cross, our own Golgotha, and if we there offer up our blood and our life to the Lord, but we do so hating the brother that Christ has given us, we do not offer ourselves purely, innocently, in holiness, and in love. This is why St. Cyprian cries out in terrifying compassion: “What a great sin it is that cannot even be met by the shedding of one’s blood! What a sin it is that cannot be washed away, even by martyrdom!” Let us not think that St. Cyprian is saying we are doomed and damned if we have hatred in our hearts. St. Cyprian, like all our Fathers, is a pastor, a teacher, one who is here to heal the broken, not to condemn them. What he is doing here is identifying a poison that is far stronger than we take it to be. Our hatred, if we do not work to combat it, to replace it with love, our hatred if we allow it to be that which characterizes our relationship with our brother, if we do not struggle with all that is in us to love our enemy, to love our brother and our friend as Christ loves the world, then this hatred will be the death of us. It will be the death of us not because Christ chooses to punish [us], to be vindictive upon us for our hatred. It will be the death of us because it simply removes from us the ability to truly offer ourselves to the Lord, that self-offering which he meets with the life of the kingdom. If we are battling Christ, how can we hope to be with him? If we are acting as the antithesis of Christ, as anti-Christ, by hating our brother where he loves our brother, how can we hope to dwell with him in the kingdom? So the positive message, the message of great hope and practical guidance for each of us, is that when in those moments we see hatred well up, when we tolerate it because “at least it’s an internal sin and no one knows,” when we begin to justify it in our hearts, saying, “At least I am not committing murder or adultery or theft,” at that moment let us remember St. Cyprian’s words. Let us remember Cain and his brother, Abel. Let us remember that it is in the small relationships, the sacrifice of my comfort and will in order to forgive and love a brother in the little things, that allow us to make the true and noble sacrifice of offering our life to God. And may we all, by his grace and by the prayers of his saints be drawn into that true sacrifice. May we dwell with him in the kingdom as he has called us to do. May we find the love of brother that leads us ever closer to the love of Christ.